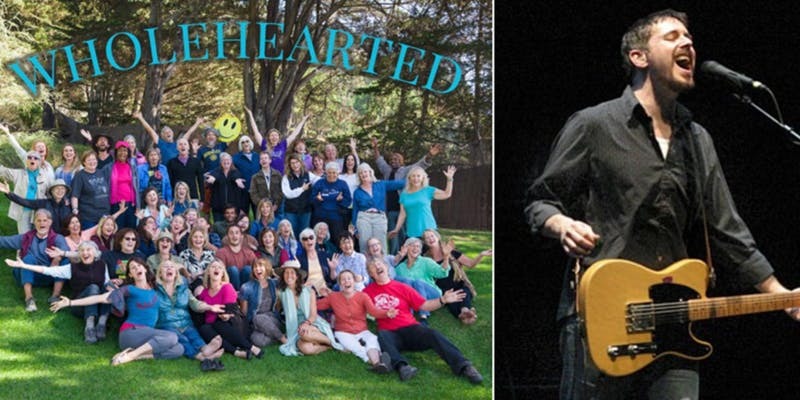 The 120+ voice Wholehearted Chorus & Kids Choir are collaborating with Toad the Wet Sprocket lead singer Glen Phillips to bring another participatory and uplifting singing event to our community. This is not your average choir concert! We will often invite you to sing along, sharing songs learned by heart, direct from the heart. The same concert will be presented twice, with Glen Phillips joining us onstage for the Sunday concert. Song Village is held in a beautiful redwood forest in the Santa Cruz mountains. Song circles are lead by guest song leaders or by the participants themselves. 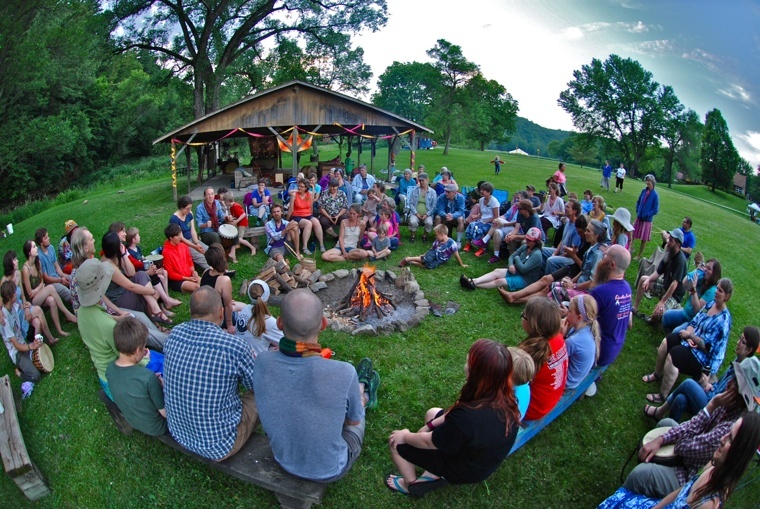 The gathering also includes fun and rich community-building events, including dance, improv theater, heart share circles, and delicious meals. Consciously facilitated to help everyone feel included and connected. The event is sold out, but you can join the waitlist HERE! 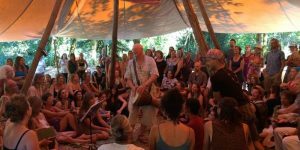 Laurence Cole has led song circles at gatherings and festivals across North America. 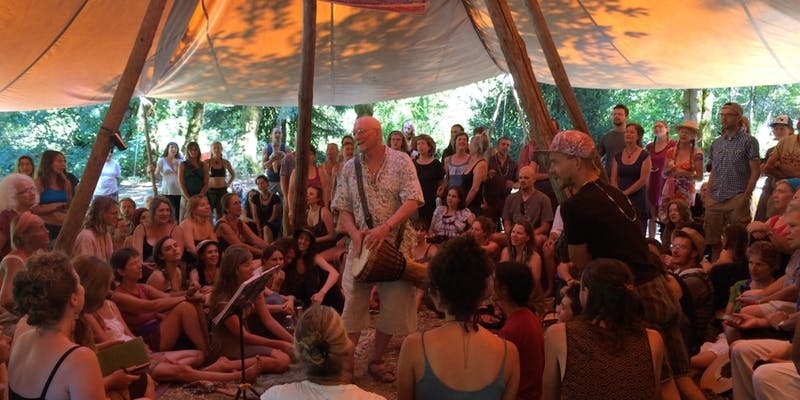 He is an advocate for reclaiming our natural right to sing together as a most basic and primal technology of belonging and connection. Through singing, we regain the enlivening power of group singing using our hearts, souls, voices, and love. Join us for an evening with Laurence Cole. This midwestern community singing festival is such a joy and features some of the finest songleaders in the country. This event is sold out! Sign up for the waitlist here. 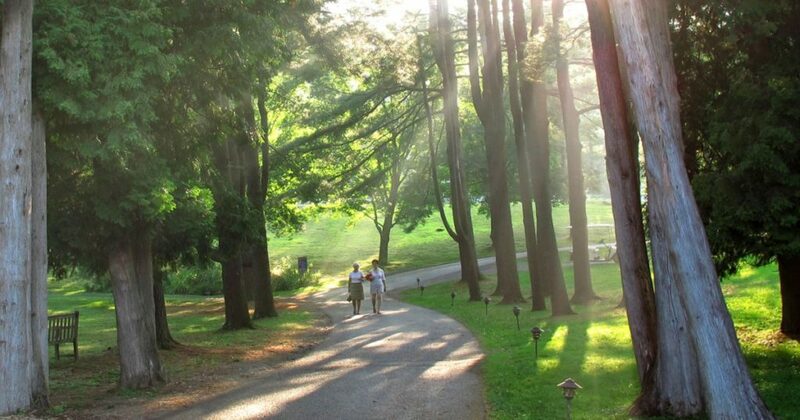 A 5-day Workshop with Lisa G.
June 16-21, 2019 – REGISTRATION OPEN NOW! Singing and dancing are two of the most universal expressions of the human spirit through all cultures and all time. In today’s Western world, singing is often relegated to the realm of performers and entertainment, distancing us from its potential as a vehicle for profound joy and healing in our communities and lives. Lisa G. Littlebird is dedicated to reclaiming song as an ancient but vital, primal technology of human connection. 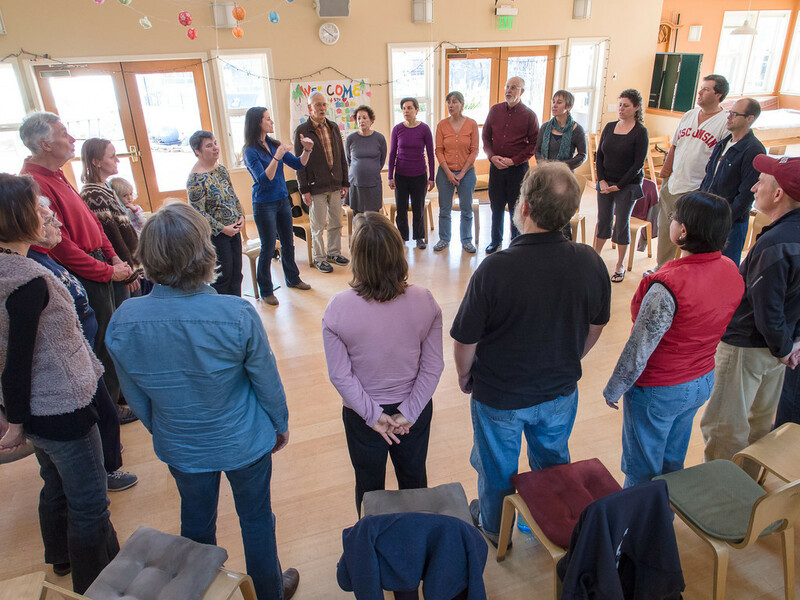 In this shared practice of singing together, we not only discover a pathway to unlimited communion and release, we offer a powerful contribution to these polarized times: compassion and empathy toward ourselves and others. Through gentle, exploratory encouragements and a diverse repertoire of more than 500 oral-tradition songs, Lisa cultivates a supportive, uplifting circle of group harmony and sound, inviting all singers to expand and delight in the full potential of their voices. She has been a popular song leader on the faculty at Esalen Institute for more than a decade and her style is rooted in compassionate awareness practices. This workshop is designed for singers of all abilities and levels of experience, including no experience or negative experience in need of healing. Come prepared to find your voice (and not just your singing voice! ), explore your capacities with curiosity and collect songs and tools to nourish your well-being and enrich your life. Join a special group of internationally emerging song bearers as we learn the art of songleading together in this 6-week online course. We’ll take a deep dive into the skills, knowledge and best practices Lisa has gleaned from more than a decade of teaching so you can quickly become an effective and successful songleader in your own community. All in the company of an international cohort of peers. The last five cohorts sold out! Register today to reserve your space in this special program. Community singing is an art of stepping to the edge together — to the edge of our own unfolding and to the edge of the conversations most needed in our collective communities. A world-class lineup of community song leaders from around the country is coming together for this celebratory property-wide singing event. We will use the power of singing together in the oral tradition to craft a recipe for our world using harmony, empowerment, connection and joy. This will be a highly collaborative weekend among the faculty, who will offer a mix of breakout sessions as well as daily gatherings with the whole group. This event is accessible and welcoming to all voices with every level of experience. Come ready to offer your voice in a potent exchange designed to sow deep seeds of inspiration, community and action on the path of justice.